On a recent trip to Ireland I ventured through a London airport. After a tasty breakfast and a spot of tax free shopping I decided to inspect the signage a little closer. I had little trouble using the signage. The directions were relatively clear and simple, but inspect a little closer the fonts used on some of the signage. At various points throughout my journey the font changed quite drastically from a serif to a sans serif font. Whether this has anything to do with old/new signage I do not know, but this lack of attention to detail is one of my pet hates. With a little thought and attention to detail good wayfinding system can easily be achieved, so why so often is it not quite right? 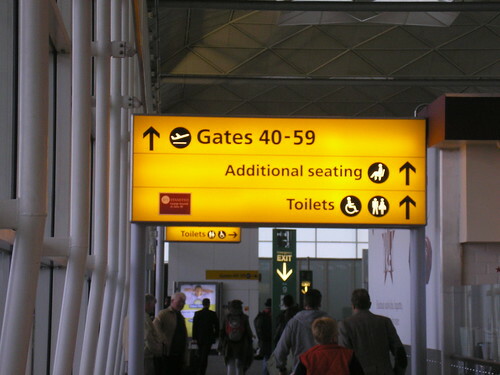 This entry was posted in Airports, Signage, Typography, Wayfinding and tagged Airports, Signage, Typography, Wayfinding. Bookmark the permalink. It must still be the holiday season as I was also pondering this at Athen’s airport the other day (opened 2001). I was looking at the greek script and noticed that not only had the font changed at adjacent signs there was an extra character in one of them (different spelling?). I’ll tweet the pics. 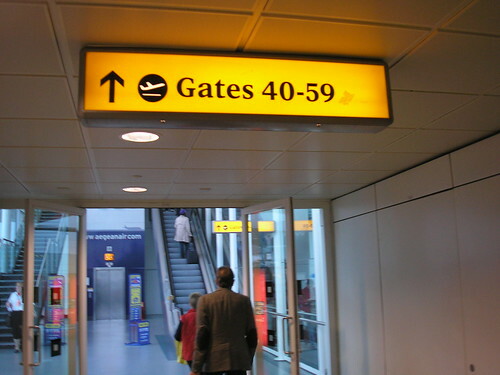 Heathrow was famous for its serif font (BAA) Bembo, but new signs are now set in Frutiger, the typeface used on almost any other airport.